Parents of children with asthma have been urged to act to prevent a spike in emergency hospital admissions as they return to school after the summer holidays. Pic: Peter Byrne/PA Wire. Parents of children with asthma have been urged to act to prevent a spike in emergency hospital admissions as youngsters return to school after the summer holidays. The Royal College of Nursing (RCN) says that on average there are three children with asthma in every classroom in the UK. And it warns that youngsters going back to school after the summer holidays are at a higher risk of potentially deadly asthma attacks. Asthma-related hospital admissions treble among school aged children in September every year, the College added. The RCN, which holds its annual school nursing conference tomorrow in London, said there are various reasons behind the rise, but it may be in part to children with asthma not regularly using their preventer inhaler during the summer holidays. A lapse in routine, changes in the weather and exposure to new coughs and colds when they return to school leaves youngsters at a heightened risk, school nurses at the conference will warn. Between August and September 2015, emergency asthma admissions in England, Scotland and Wales for children aged up to 14 tripled, from 1,089 to 3,203, the RCN said. Parents should ensure their children are taking preventer medication and book their child's annual asthma review before the school term starts with their GP or asthma nurse. They should also ensure their child has a personalised asthma action plan and discuss the plan with their child's teacher. Meanwhile, children's backpacks should contain their reliever inhaler, spacer and care plan. Fiona Smith, the RCN's professional lead for children and young people, said: "Changes in routine during the holidays, the stress and excitement of going back to school, as well as being exposed to new virus and colds, can leave children more vulnerable to asthma attacks. "Children should not have to miss days off school because of their asthma. Booking your child's annual asthma review before the school holidays end can help them manage their asthma and flag any new triggers before term starts." Asthma UK has issued an alert to Scottish parents where children have already begun their return to school. 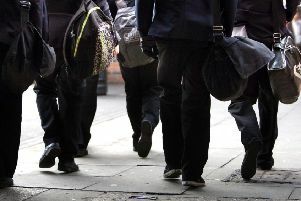 Sonia Munde, head of services at the charity Asthma UK, said: "Going back to school should be an exciting time for children, but many end up in hospital fighting for life after an asthma attack. "This is extremely distressing for a child and their parent. It could be avoided if parents know how to spot their child's asthma is getting worse and know what to do if their child is having an asthma attack. "Parents should not feel afraid to book an urgent appointment with the GP or asthma nurse if their child is using their reliever inhaler (usually blue) three or more times a week, coughing or wheezing at night, or feeling out of breath and struggling to keep up with their friends." Parents can find information and support at Asthma UK's website here.